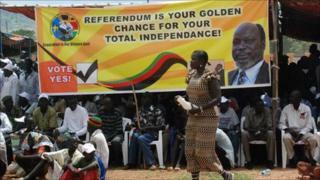 Former south Sudanese rebel Diing Dhel stretches his T-shirt to show its slogan: "Referendum is your golden chance for total independence." It is a common message plastered on posters and banners here in the southern capital, Juba, as the war-damaged region prepares for a historic vote due on 9 January 2011. Excitement is high, with many believing the south will choose secession and divide Africa's largest nation in two. Every month hundreds take to the streets in cities across the south waving flags and chanting slogans demanding the vote is held on time. But with just over 80 days to go, much preparation still needs to be done. "We have fought and waited for years for the chance to decide our future," said Mr Dhel, whose shirt carries a logo showing chains being cut from black fists, set against a backdrop of the southern flag. The referendum is part of the 2005 peace deal that brought to an end more than two decades of civil war fought over ethnicity, oil, religion and resources. More than two million people died in the conflict between the Arab-dominated, Muslim government in the capital, Khartoum, and rebels from the marginalised south, where most are Christians or follow traditional beliefs. "Too many people have already died to let this chance to choose go to waste," the soldier-turned-independence campaigner adds. But fears in the international community are growing of the risk of renewed conflict, with southern worries that former civil war enemies in the north will try to scupper the vote. UN Secretary-General Ban Ki-moon has said the country is one of his "top priorities", while US Secretary of State Hillary Clinton has called it a "ticking time-bomb." Some critics say the time left to organise a credible vote is too short, but many fear war if it does not go ahead on time. Envoys from the UN Security Council toured the country earlier this month, while even Hollywood film star George Clooney has been for a flying visit to warn of potential "genocide". Southerners fear any delay could lead to the vote being cancelled, and so demand it must go ahead. The United Nations and aid agencies say they are busy preparing contingency plans in case violence does break out. But the challenges left to hold the vote are huge. Voter registration has yet to begin - a massive challenge for this vast region left in ruins by the long years of war. The south is about the size of Spain and Portugal combined, but with only some 60km (40 miles) of tarred roads. The UN has said it will boost peacekeeping troop numbers in "hotspot areas" along the still un-demarcated border, which is rich in oil. Many too are worried about the 1.5 million southerners aid agencies estimate live in the north, and what will happen to them should the south choose to secede. The contested oil-producing border region of Abyei also remains a concern. It is due to hold a simultaneous vote on whether to join the north or the south. Talks on outstanding issues over holding that vote broke down last week, with the south angrily dismissing northern claims it is now impossible to hold it on time. Both sides have accused each other of building up troops along their mutual border, and of blocking campaigners, either for unity or independence. Yet despite gloomy warnings from outside, there is an incredible sense of optimism and expectation on the streets of Juba. "Tell the outside world we are not talking conflict, only about freedom to choose our own destiny," said William Luca, a student at Juba university. "Talk of war leads to war," he added. Southern President Salva Kiir has repeated the same message in several speeches in recent weeks: That the referendum date is "sacrosanct", and that there will be no more fighting. "We want peace and no more war," said Mr Kiir last week, who is also first vice-president of all Sudan. "No drop of blood should be shed again," he added, speaking in a political reconciliation conference held last week to bring former southern rivals together. While Sudan's oil reserves were a driving force for war in the past, some hope they could now provide the needed pressure for peace. Sudan is the third largest oil-producer in sub-Saharan Africa, and more than 80% of the country's known oil reserves are thought to lie in the south. However, with all pipelines running north, leaders point out that both sides would benefit if they could strike a pragmatic agreement. "It is in our interest to see that the north remains a viable state, just as it should be in the interest of the north to see Southern Sudan emerge a viable one too," said Mr Kiir. Negotiations continue between the ruling parties in the north and south on potential post-referendum arrangements - looking at future issues such as citizenship, security, finance and wealth-sharing. Southerners say they still believe the vote can be held on time, pointing out that similar warnings were given before elections in April, where the worst international fears were not realised. "Of course it is true that not everyone in the south is for separation," said John Leec, a teacher. "But those involved in delaying tactics to damage the vote must stop, and allow a fair choice to be made. That is the only way Sudan can remain at peace." Tensions are rising, but southerners remain positive. "There are many cynics who say Sudan is a married couple in angry divorce, so they are frightened of the violent fights," said Mary Tombe, a nurse. "But we see Sudan as a mother giving birth to twins - once the labour pains are over, the two children can grow up as friends."